Left to right: Mr Wong Fong Fui, Chairman of Boustead, Ms Ng Chiang Ling, CEO of M&G Real Estate Asia, Mr Wong Heang Fine, Group CEO of Surbana Jurong, Mr Liew Mun Leong, Chairman of Surbana Jurong, Dr Loo Choon Yong, Chairman of JTC and Mr Moshe Safdie, Principal of Safdie Architects at Surbana Jurong Campus’s groundbreaking event. 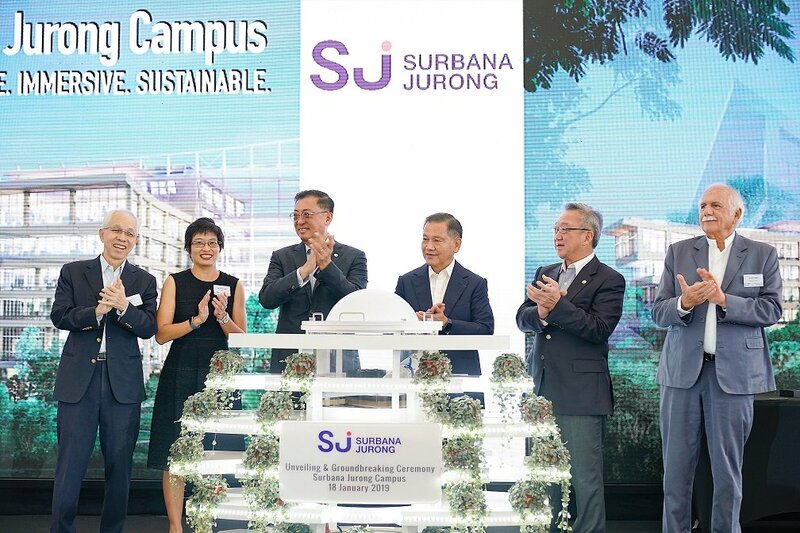 Singapore, 18 January 2019 – Surbana Jurong (SJ), one of the largest Asia-based urban and infrastructure consulting firms, held a groundbreaking ceremony today for its new campus which will house its global headquarters in Singapore. Named ‘Surbana Jurong Campus’, the 68,915 sq m development will be built in Jurong Innovation District (JID), a vibrant ecosystem of enterprises in advanced manufacturing, urban solutions and smart logistics. The Campus can accommodate up to 4,000 employees and will be completed by 2021. The Campus will support SJ’s rapid growth by facilitating stronger teamwork and knowledge sharing among its Singapore and global talents, and will serve as the nerve centre for research and development of innovation for the built environment as SJ transitions to applied research to create and bring practical and viable solutions to the industry and community. The Campus’ location in JID provides the Company access to a vibrant and collaborative ecosystem of R&D and capability developers, startups, and technology enablers for potential collaborations to accelerate the adoption of smart technologies and solutions. Designed by Safdie Surbana Jurong, a collaboration between Safdie Architects and Surbana Jurong established in 2017, the Campus will serve to demonstrate what a sustainable, people-centric and future-ready workplace would look like. 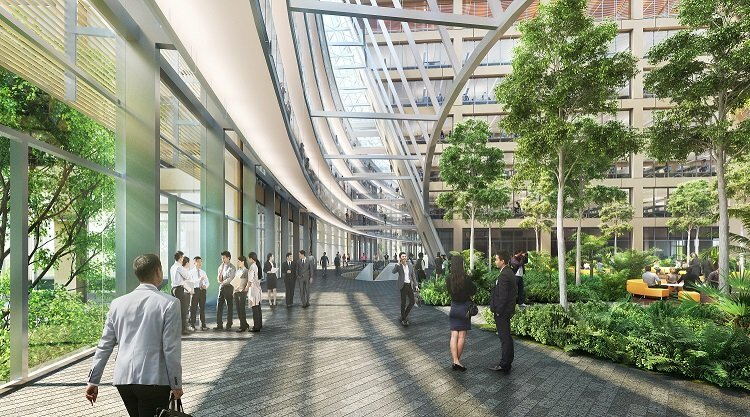 Created by renowned architect Mr Moshe Safdie, the design of the new headquarters embodies the character of Singapore as the Garden City by integrating the structure harmoniously with the natural landscape. Situated on a previously undeveloped greenfield site, the Campus will push the boundaries of sustainable design in both construction and operation. SJ’s multi-disciplinary team of experts will undertake the entire development from start to end. This encompasses consultancy solutions from project funding, architecture and landscaping, engineering, workplace strategy, cost and project management, through to integrated facilities management and security services. The building of Surbana Jurong Campus will embrace the use of digital technologies to scale up productivity and efficiency, and is well aligned with Singapore’s push to transform the built environment sector. The development will demonstrate SJ’s leadership in leveraging Building Information Modelling (BIM) and extending it to a comprehensive Integrated Digital Delivery, or IDD. IDD fully integrates processes and stakeholders along the development value chain through advanced info-communications technology and smart technologies. Additionally, SJ will apply its proprietary solutions such as BIM:FM technology to the facilities management process to increase productivity and achieve cost savings for long-term building maintenance and operational cycle. The construction will also utilise the Design for Manufacturing and Assembly (DfMA) approach with the use of precast materials, a signature competency of SJ utilised in its affordable housing projects. To drive innovation, the Campus will be a living lab with dedicated spaces for research and test-bedding of new ideas, including test-bedding future-ready solutions developed by the SJ-NTU Corporate Lab, a joint corporate laboratory set up by SJ, Nanyang Technological University, Singapore (NTU) and the National Research Foundation Singapore. In line with SJ’s commitment towards delivering sustainable urban solutions, the Campus pushes the boundaries of sustainable design in both construction and operation. It is designed to meet Singapore’s Building and Construction Authority’s (BCA) Green Mark Platinum Certification for Super Low Energy Building. The Campus utilises solar photovoltaic technology which will yield around 340MWH of renewable energy annually, and integrates features such as rain gardens and bio-swale to enhance water sustenance. It also boasts many other green technologies, including smart lighting control, underfloor air-distribution system, and predictive smart building control systems such as live energy and water management dashboards. SJ adopted a ‘develop and lease’ model to fund the development of the Campus. The Campus is being developed by Surbana Jurong Capital, the investment arm of SJ, which secured 100% funding for the development of the property and subsequent lease agreement for the entire land lease tenure from M&G Real Estate, one of the world’s leading financial solutions providers for real estate investors. This arrangement provided SJ with a compelling, long-term and cost-effective solution in developing the property for its use. Headquartered in Singapore, the Surbana Jurong Group has a global workforce of over 14,000 employees in more than 120 offices across over 40 countries in Asia, Australia, UK, the Middle East, Africa and the Americas, and an annual turnover of around S$1.5 billion. The Surbana Jurong Group of companies include SMEC and Robert Bird Group in Australia, Sino-Sun in China, AETOS, KTP, SAA in Singapore and B+H in Canada. Safdie Surbana Jurong (SSJ) is a long-term collaboration between Safdie Architects and Surbana Jurong to jointly pursue major design projects within Asia-Pacific. Established in 2017, SSJ combines the strengths of each partner to achieve projects of the highest-quality design across a range of typologies. It focuses on residential, commercial and institutional projects which require unique planning and design expertise to create world class iconic architecture projects in Asia-Pacific. Safdie Architects is an architecture and urban design studio imbued with a spirit of idealism and innovation. With intense personal involvement of Moshe Safdie and the core group of principals, the practice operates in the model of a design studio environment—research-oriented and forward-thinking, drawing upon a depth of experience to solve contemporary building challenges in imaginative and unexpected ways. Safdie Architects is active in a wide variety of project types, scales and sectors, designing museums, cultural centers, libraries, housing, mixed-use developments, transportation centers and master plans in geographically and culturally diverse places. The studio’s projects around the world have become beloved resources and symbols of their communities as well as regional and national landmarks. The practice has its design headquarters in Boston with offices in Jerusalem, Toronto, Shanghai, and Singapore. M&G Investments is part of M&G Prudential, a savings and investment business which was formed in August 2017 by our parent company, Prudential plc and has £277.9 billion of assets under management. M&G Prudential has over 7 million customers in the UK, Europe and Asia, including individual savers and investors, life insurance policy holders and pension scheme members. M&G Prudential is set to demerge from Prudential Plc to become an independent company listed on the London Stock Exchange. Its £31.7 billion property arm, M&G Real Estate, is a leading financial solutions provider for global real estate investors, has a sector leading approach to responsible property management and is committed to continuously improving the sustainability performance of its funds. M&G Real Estate has offices in Singapore, Seoul and Tokyo dedicated to real estate in the Asia Pacific region. M&G Real Estate in Singapore is a subsidiary of London-based M&G Real Estate. As at 30 September 2018, the Singapore office is responsible for US$5.8 billion in assets.